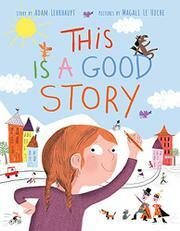 A young white girl writes and illustrates a story, which is critiqued by the narrator as it is created. The girl begins her story by drawing a Hero. Then she thinks maybe a Heroine would be better. Then she decides both will work. She places them in “a good town, filled with good people, called our Setting.” The narrator, an unseen editor who lurks over the artist’s shoulder, tells the storyteller she needs to put in some Conflict, make the Evil Overlord scarier, and give it better action. This tongue-in-cheek way of delivering the rules of creative writing is clever, and paired with Le Huche’s earnest, childlike illustrations, it seems to be aimed at giving helpful direction to aspiring young creators (although the illustrations are not critiqued). But the question needs to be asked: do very young writers really need to know the rules of writing as determined by adults? While the story appears to be about helping young readers learn writing—there is “A Friendly List of Words Used in this Book” at the end with such words as “protagonist” and “antagonist” (glossed as “Hero and Heroine” and “Evil Overlord,” respectively)—it also has a decidedly unhelpful whiff of judgment. Rules, the text seems to say, must be followed for the story to be a Good one. Ouch.